KANDIANA, Zambia, Apr 17 2010 (IPS) - Josias Akataama spent March watching the moon wane above, and flood waters rise from below. Only with the sighting of the new moon, would the men, women and children of Kandiani know when they could leave the water-logged village for higher ground. Akataama is Lozi and his village lies in the Zambezi valley in western Zambia, in an area known as the Barotse Flood Plain. The villagers are proud of their proximity to Lealui, the royal village of the Litunga, the Lozi king. And it is for this reason that nobody has ever thought of abandoning their village, despite its annual submersion. Floods are usually thought of in terms of distress and deprivation, but for the Lozi, floods are a source of happiness. Among the Lozi people a good rain season is one that covers the entire flood plain. “It feels good to see the plain begin to flood in early January. The water will creep in from the river like a giant serpent and you know Kuomboka is also coming,” said Akataama. Like most men in the villages of the plain Akataama, has volunteered to paddle the Litunga from the flooded village of Lealui to his other palace in the high ground town of Limulunga. But few will be admitted to the royal barge, the Nalikwanda, or its lesser boats. The wide open spaces of the flood plain also support sizable herds of cattle. The Western Province has the second highest number of cattle in Zambia after Southern Province. According to official statistics of the ministry of veterinary and livestock services, nearly 700,000 of the countries estimated 2.6 million cattle are scattered across the province's Barotse flood plain. "The cattle herd in Western and Southern Provinces would have been higher had it not been for the presence of cattle diseases that have decimated many animals over the years," an official at the ministry explained. The region's cattle have been affected by a litany of illnesses: anthrax, contagious bovine pleuropneumonia, black quarter or black-leg, haemorrhagic septicemia and trypanosomiasis in the southern districts of Shangombo and Sesheke. As a result, Western Province is banned from exporting live animals to Lusaka or to the European Union, creating opportunities for cattle herders in neighbouring Botswana and Namibia. By the end of February the entire flood plain had begun to look like a vast lake, threatening to dissolve villages on lower ground. Akataama is lucky though. Kandiana village was built on a man-made mound known as a ‘suuba’, to keep it above the flood waters. But this year, by the beginning of March, the Zambezi’s waters were knee-high throughout the whole settlement. And with it had come snakes in search of shelter and warmth; colonies of dark brown fire-ants known locally as ‘sului’ and the ever-present threat of crocodiles and hippos. On Mar. 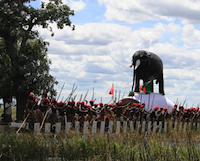 17, Litia Walubita, the acting Ngambela, or prime minister, of the Litunga, finally issued a statement informing all that this year’s Kuomboka ceremony would be held on April 17. The Ngambela is the traditional mouthpiece of the Litunga at Kuomboka ceremony and in matters of tradition. “It is taboo for the Litunga to either make public statements or entangle himself in issues of politics,” Walubita said. It is also forbidden among the Lozi people for any villager to leave the flooded valley for higher ground before their king does so. Only then can the villagers leave their flooded villages, load their possessions into dug-out canoes and row behind the king’s flotilla to higher ground on the edges of the flood plain. They will return to the flood plain around July to begin the whole cycle once more. “Without the annual floods there would have been no real agriculture here. Floods make it possible for us to grow rice without applying any chemical fertilisers,” says Silumesii Akabondo, a farmer from Nandopu village. The annual exodus of the Lozi is thought by historians to date back to about 1500 when a remnant of the Luba-Lunda empire in present day Democratic Republic of Congo broke away and migrated southwards to what is today known as the Barotse Flood plain. Akabondo retired from the Nchanga Copper Mine, on the Copperbelt, ten years ago, and began rice farming in a small way in his home village. He did well, and expanded his farm. In 2009, Agricultural Development and Management Services (ADMS), a non-governmental organisation working on reducing poverty in rural areas, introduced Akabondo to growing wheat and for the first time he realised the full benefits of the flood plain. ADMS gives farmers not only wheat, but seeds for vegetables like tomatoes, spinach, and carrots, which they plant in April and May. The seed distribution is supported by funds from donors, including the European Union, the Japanese International Cooperation agency and USAID. Akabondo insists the fertility of the valley is unparalleled. In addition to agriculture, the rivers in the plain boast numerous fish that come to the area to spawn and feed on the tender grass known as ‘mutaka’ and which remain in the Zambezi river after the flood waters are gone. “Kuomboka is a traditional ceremony that is necessitated by economic survival,” says the chair of the 2010 Kuomboka ceremony organising committee, Oliver Saasa. Over time it has evolved into a ceremony that has attracted visitors from all parts of the globe. Charles Mushitu, the secretary general of the International Committee of the Red Cross in Zambia, explains that though most Lozi people choose to live on the flood plain, there are also cases of families displaced by floods outside the normal flood area. The Red Cross and Zambia’s Disaster Management and Mitigation Unit are supporting several families in Senanga and Lukulu districts of the province who were displaced by floods earlier this year.